These are the baseline specs that you’ll need to run the game, if you are near the lower end of the settings here you probably won’t have great performance. 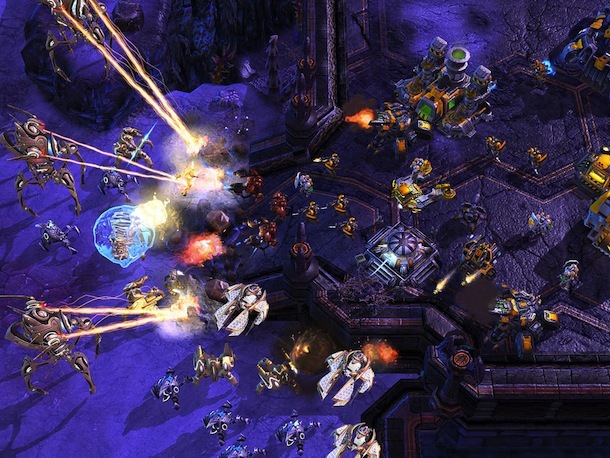 Obviously the better and newer your Mac, the better Starcraft II will perform on it. You can order Starcraft II: Wings of Liberty on Amazon.com . For what it’s worth, I have a brand new 2010 MBP 15.4 inch with 2.66 Core i7, 8gb RAM, 512mb nvidia gfx setup, and an Intel X-25M SSD, and on max resolution and high settings the game was jumpy and would recommend I lower the settings. I really hope they can patch this, because my hardware should run a relatively simple game like SC2 a hell of a lot better than this. This is my first experience trying to game on a Mac. If it doesn’t improve, I may be grabbing the PC copy and putting it on my slightly older, slightly lower performance desktop (3 ghz quad core, 4 gb ram, 7200 rpm hdd, 1gb radeon) and see what happens. I have the same problem, i’m running the game on Mac Pro with 8GB ram and Eight 3Ghz cores and Nvidia card and its still choppy on the “high” setting. My machine should be able to handle the “ultra” setting let alone the High. When i select the default setting, the game sets it to high and then doesn’t run smoothly. I’ve never had this kind of problem before with any mac game (and especially not blizzard titles), I think this is a software issue with the game and i hope they fix it. After I found SCII jumpy resolution on OSX 10.6, I boot into Win7 and everything is crisp. I think SCII is not yet optimized for OSX 10.6. I agree, runs much better in boot camp. I can have settings on high in windows, has to be all low in mac os to get the same frame per second. I have brand new 15.4″ MBP with 2.66 ghz i7, and 512 mb Geforce 330m…. This system should be playing this game liquid smooth and it is choppy, I have lowered the settings to many different configurations from everything to the lowest including resolution and a few different combination. I also forced the use of the 330m vpu just in case it was the switching. None of this works, I have other games that run very smoothly on the very highest settings SCII needs to be patched…. YESTERDAY. . .
Is it safe to assume if you can run the demo smoothly the real game will play much the same?